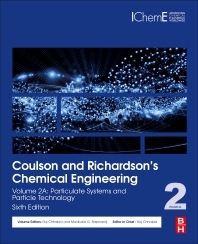 Coulson and Richardson's Chemical Engineering: Volume 2A: Particulate Systems and Particle Technology, Sixth Edition, has been fully revised and updated to provide practitioners with an overview of chemical engineering, including clear explanations of theory and thorough coverage of practical applications, all supported by case studies. A worldwide team of contributors has pooled their experience to revise old content and add new content. The content has been updated to be more useful to practicing engineers. This complete reference to chemical engineering will support you throughout your career, as it covers every key chemical engineering topic. Fluid Flow, Heat Transfer and Mass Transfer has been developed from the series’ volume 1, 6th edition. This volume covers the three main transport process of interest to chemical engineers: momentum transfer (fluid flow), heat transfer and mass transfer and the relationships between them. Particulate Systems and Particle Technology has been developed from the series’ volume 2, 5th edition. This volume covers the properties of particulate systems, including the character of individual particles and their behavior in fluids. Sedimentation of particles, both singly and at high concentrations, flow in packed and fluidized beads and filtration are then examined. Separation Processes has been developed from the series’ volume 2, 5th edition. This volume covers distillation and gas absorption, which illustrate applications of the fundamental principles of mass transfer. Several techniques—adsorption, ion exchange, chromatographic and membrane separations, and process intensification—are described. Chemical and Biochemical Reactors and Reaction Engineering has been developed from the series’ volume 3, 3rd edition. Before joining IIT-Madras in February 2011, Dr. Gurappa spent 3 months as visiting fellow at KULeuven (Belgium) in Prof. Jan Vermant’s group. He was a postdoctoral researcher with Prof. Norman J. Wagner at the University of Delaware (USA). He studied chemical engineering at SIT, Tumkur (Bangalore University), and received a M.S (Research) from IISc, Bangalore, by working on - the determination of local dispersion coefficient and local holdup in a packed bed using X-rays. His PhD in chemical engineering is from KULeuven, Belgium (Prof. Jan Vermant) and his PhD thesis was on - Tailoring colloidal gel rheology in bulk and at interfaces: Exploiting shape and surface chemistry effects.